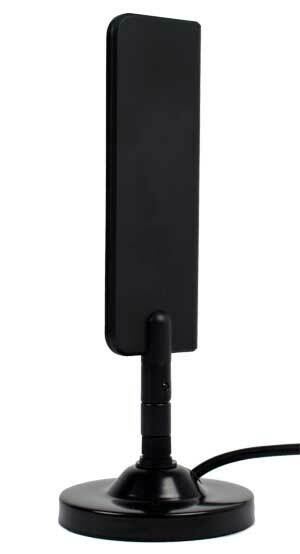 3Gstore is thrilled to announce the Taoglas 8” Indoor/Portable Full-Band 3G/4G Antenna, the newest addition to our lineup of 3G and 4G cellular antennas. Perfect for travelers, business trips, or for those who need an antenna but don’t have the option to permanently mount one, this sturdy and versatile antenna can be adapted to a number of situations. This new antenna replaces a previous long-standing 3Gstore customer favorite, the 6” Booster Antenna, which went “end of life” earlier this year. The Taoglas 8” Indoor/Portable Full-Band 3G/4G Antenna does everything the Booster Antenna did, but has several additional advantages, including a longer cable (8’ vs 3’), slightly higher gain, a sturdier design, and a hinged connector for both horizontal and vertical mounting options.